The Jewish heritage sites in Poland are in the main ruined synagogues, cemeteries, mikvah houses and houses of study. In some cities, which used to be the home of large and prosperous Jewish communities, a single impressive building might survive. The site of paramount importance to Judaism is a mound of rubble with a single surviving wall, a collection of stones unembellished by any relief, mural or inscription. Even though devoid of these material traces and appropriated by other religions, cultures and nations, this point in space remains at the heart of Judaism. It is the place where the Temple once stood, where priests brought sacrificed, and where the whole nation were convoked to three times a year. Despite its tragic devastation, the Jerusalem Temple Mount continues to radiate its power and to quicken the Jewish people. When the Babylonians destroyed the First Temple of Jerusalem, the rabbis acted with the survival of the nation at heart as they replaced the temple sacrifices and ceremonies with prayer and study. In countless places of their exile, Jews gathered to pray and study the Torah together in their homes or makeshift buildings or simply somewhere in the marketplace or a field. Batei Knesset or the houses of the assembly (in Greek: synagogues) protected the Jews from assimilation and dissolution in the cultures and the peoples among which they lived. As the Talmud says, synagogues are like vineyards: when visited in winter, they exhibit dry branches and give no hint of their future blossom or fruit; and even the ripe fruit does not reflect the taste of the future wine, which takes time to reach perfection. Synagogues too have their “seasons,” the times when they are filled with crowds, hustle and bustle, teaching, prayer and song, and the times of silence and even desolation. There is a Jewish legend that speaks of the custom of refraining from repainting the synagogue walls, because it is believed that the prayers of previous generations stick to them as dust would. That measure ensures that the prayers of the times past are bound with those of the future, and that way are never alone. There are synagogues which, through their history, create a bond with the past, which are monuments and memorials of the times past. As the sole surviving synagogue of Warsaw, the Nożyk Synagogue stands as a reminder of how Jewish Warsaw used to be before the Shoah. Whilst praying within its walls, it is difficult not to sense the immense scale of the crimes committed in this city. Many visitors to the Nożyk Synagogue consider, above all else, that past: the times of glory, the praying crowds, the great rabbis and the brilliant cantors, as well as the desolation that followed their disappearance. Visits of this character are generally brief and offer little opportunity for taking note of the present, which is not as abundant and lively as eighty years ago, yet Jewish life continues here. It is the minyan or a quorum of 10 coming together to prayer that is decisive to the life of a synagogue. Without that minimum number, not all the pray can be recited, and the Torah scroll cannot be read publicly. The ability of minyan to assemble daily is a testimony to a community’s and synagogue’s vitality. Minyan is a measure of the sense of belonging and mutual responsibility among the Jews of a given city. The Talmud refers to anyone who has a synagogue in their city and fails to pray in it a “bad neighbour.” Joint prayer and learning form the community and build bonds between individuals and families, which makes “the vine blossom” (the Babylonian Talmud interprets this phrase of the Song of Songs as referring to those who study the Writings). Through the daily minyan prayers and reading of the Torah on Sabbaths, holidays, Mondays and Thursdays, this vineyard in the Nożyk Synagogue continues to blossom with various degrees of abundance. Through the kolel, a group that meets on a daily basis to study Torah, Mishnah, Gemara and other writings of great rabbis who were active in Poland and in other countries of the Jewish Diaspora, “their buds open and the pomegranates are in bloom” (Song of Songs). Historically, a synagogue would be erected in the central point of the Jewish quarter, with all other institutions around it. This geographical centre indicated how dependent the life of the Jewish community was on what happened in the synagogue. 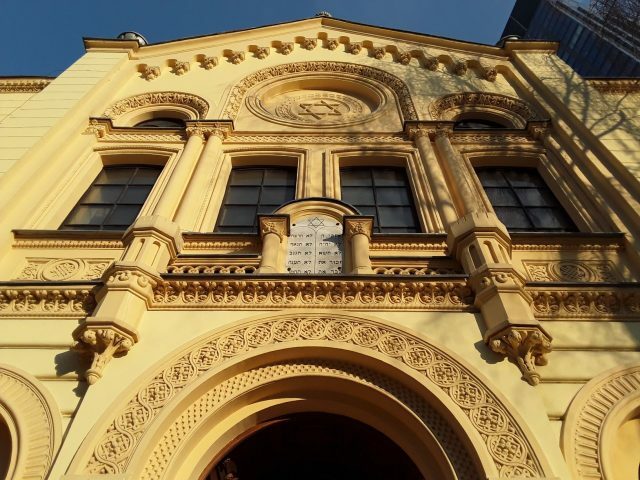 Though there is no Jewish district in Warsaw today, most of the communal institutions are centred around the Nożyk Synagogue, reflecting this traditional relationship. The Nożyk Synagogue organises joint celebrations of the Sabbath and other Jewish holidays, and provides lectures. Joint prayers are also held on the occasion of extraordinary events, threats or disasters, important anniversaries, etc.